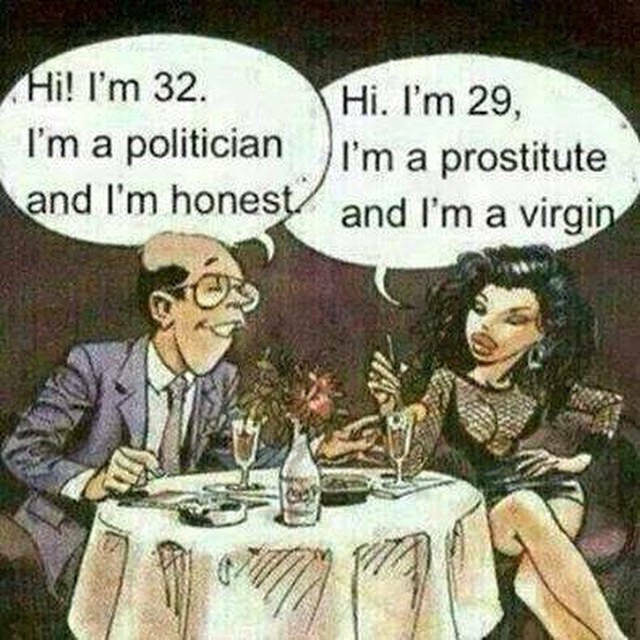 In politics people seem to be done with being polite and holding back or diluting their opinions, and while some of the opinions expressed may be intolerable to people, at least the people speaking are being honest (well, to a degree). When someone steps into the political arena, and that may be as a politician, or as an entertainer (something that’s been happening a lot more lately it seems) they must expect to be dealt with in the same way as those operating in that field. Can someone who seems a little ill-educated, or whose view is not the same as the government, get short shrift, and be treated in a way that someone might consider bad or unfair? Sure, but that is the agreement they have entered into – at least in this current political climate. Civility has taken something of a back seat, and if it isn’t exactly honesty, it is at least speaking of the mind (not exactly the same thing). The gloves are off. When professional politicians are playing hardball with each other, and slinging around all kinds of accusations, to open your mouth is to invite rebuttal, and expecting to say something without this return communication and a certain amount of trolling is being naive. Is it an ideal scene to have this kind of thing happen? No. Is it what is likely to happen? Yes. Science is more of a political football than it has been in a long time – whether it is environmental science, medical science, or just general research. You can’t engage with a field that is politicized and then not expect to draw fire. You can’t use the same celebrity as a shield that you used as your platform from which to communicate. Live by the sword, die by the sword, as the old adage goes. Advertising companies, which aren’t known for using politics to sell their products, have drawn as much fire as wannabe celebrity political pundits. Pepsi and Kylie Jenner’s ill-thought out use of, what? Protest chic? Was ridiculed for trying to capitalize on the marches for Women and Science. Why? It’s dishonest, and against the spirit and aim of the protests. It’s interesting where you have a President that runs rough-shod over the media; who has used social media to disrupt the traditional way that reporting is done, and the traditional way that President’s interact with their people – it is unsettling. He was also a reality TV star, and some people believe him to be ill-suited to his current role, while others love that he is a non-traditional political figure causing upheavals amongst the establishment. It makes for good entertainment, but some people probably feel that their experience is a little too close to being in The Apprentice. It’s strange that being polite has come to have such a negative connotation. It isn’t equated with respect; instead it denotes someone that is holding back; someone who is perhaps a little milquetoast, not plain-spoken, perhaps dishonest. Bluntness, forthrightness, being plain-spoken … these are the things that people want. If you get asked a question and you go through that dance of avoidance, that towing of some invisible party line, or give the appearance of self-censorship people now suspect you have something to hide. There is a virtue in lacking an edit mechanism – at least in the eyes of the voting base. The media, and their criticism? What does it matter to someone who gives it no credence to those speaking, and whose followers treat it likewise? What does it matter to those who voted for someone now being told that the things they like about their candidate are the things that are wrong with him? Is it strange that it somehow seems better to have problems with someone for their reprehensible opinions than to have an issue with their dishonesty over them? It makes the beast easier to identify and therefore easier to fight back against. More honesty all round might be painful, but is going to be a better thing in the end. For marketing it has always worked better if the salesman is telling the truth, because it doesn’t take much effort to uncover the lie. In politics you may have had to dig a little deeper in the past, but now people feel a lot freer to let you know exactly where they stand, and this is definitely an interesting development.